A five-year-old recently asked me, "Who invented words?" It is sobering how impotent we linguists are in the face of that question. Because language is ever in a state of transformation, today's languages cannot tell us what the words were like in the first language humans spoke, likely in Africa between 150,000 and 200,000 years ago. And because those humans lacked writing and we humans lack time machines, we cannot know how the first words were created. Was a cat called a "meow"? Possibly. But that just barely scratches the surface. What decided the word for arm? Or maybe, or or? Like the origin of the universe, the death of Richard II, and Orson Welles' cut of The Magnificent Ambersons, the answer to that five-year-old's question will lie forever tantalizingly beyond our reach. The fashion nowadays is to insist that animals use words as well, such that human words are less of a miracle than we might think. However, between human language and even the most sophisticated animal communication systems lies an awesome gulf. Be it primates mastering some sign language, or bees dancing in the hive to communicate where food is to be found, parrots' "speaking," and assorted animals' alarm calls, the animal has yet to be found whose language serves beyond the primal functions of avoiding danger, showing aggression, seeking mates, and seeking food. Certain signs for a small set of physically urgent goals, always within the immediate context—human language is vastly more than this. The ape using sign language, for example, rarely initiates conversation just for its own sake, and just as rarely comments upon something to share an impression. The commenting aspect is key. Human language is not merely about labelling, but combining a subject with an observation about it—a predicate—to yield a statement. The statement, as opposed to the one-word yawp, lends itself to another cognitive leap: reference to the past, the future, or the hypothetical rather than the here and now. This renders what seem the simplest of statements into something unknown in any other animal. Who'd even know? one might ask in any number of situations. The very activity of posing a question, as opposed to making a statement, goes beyond anything known in the most charmingly sophisticated of apes or parrots. Referring to a mental state such as knowing and being understood is, again, a miracle compared to vervet monkeys having a call that means "jump up in a tree to avoid a leopard" and another one that means "run under a bush to avoid the eagle." Then the even in Who'd even know? adds the nuance of specifying that the proposed action is, first, naughty, and second, would nevertheless not be detected and therefore would occasion no punishment. To be able to effortlessly produce and process language of this kind is unique to humans, no matter how much you surmise that your cat "understands" you. One wishes to know how it got started. Many humanists feel that the very question is misposed. They prefer a scenario under which humans developed higher intelligence—a process easy to imagine as a typical instantiation of Darwinian natural selection, they argue—and that language merely emerged as a system of vocalizing thought processes. Here, the question as to how the first word labels were created remains—how do you come up with a sequence of sounds that means run?—but how humans strung the words together into thoughts becomes less of a head-scratcher. The thoughts were already there; the words just tracked along with them. 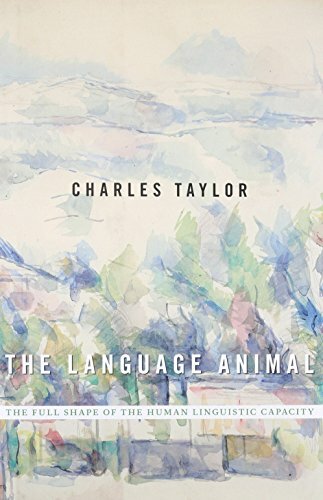 In The Language Animal, Charles Taylor argues against this reconstruction, which he traces to foundational work by philosophers Thomas Hobbes, John Locke, and Étienne Bonnot de Condillac, who saw language as simply expression of thought that already existed. Taylor elaborates upon a contrary hypothesis, traceable to Wilhelm von Humboldt, Johann Herder, and Johann Hamann, that it is language that makes sophisticated human thought even possible. In the terms Taylor uses, language was constitutive of thought rather than merely descriptive of thought already thriving. Given that we can think without words, the idea that language creates thought rather than merely reflecting it is inherently stimulating in its counterintuitiveness. Taylor's book, however, will only partially satisfy most readers interested in how language makes us different from animals. Taylor's prose is careful, and even accessible. Yet sprightly is not one of the adjectives one might choose to describe his writing style, nor is brisk—the book could easily lose a good 75 pages. Taylor seems most accustomed to an audience of academic philosophers; for those outside that group, treatments such as Derek Bickerton's Adam's Tongue and Thom Scott-Phillips' Speaking Our Minds are more engaging explorations of why humans are the only animals with language.